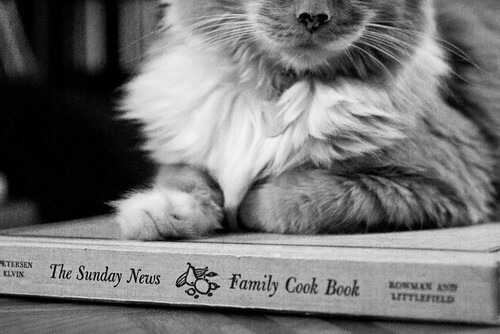 One of my birthday presents this year was a truly enthralling item: The Sunday News Family Cook Book. It was published in 1962 by the New York News, and includes “favorite recipes” from readers as well as recipes from the paper itself. Many of the dishes in it sound just fine, although instructions are occasionally a little vague. 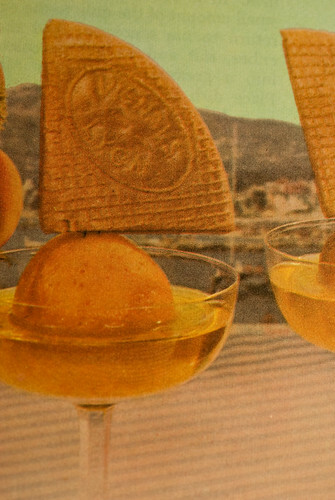 Others, however, are mind-numbingly weird, and the food photography is…um…fascinating. 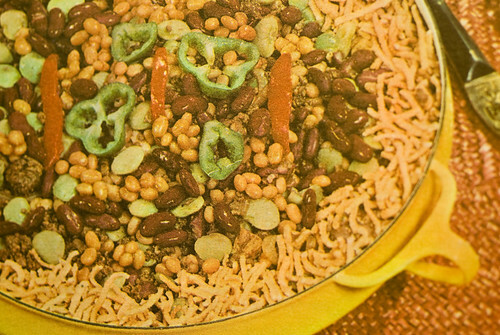 Have you seen James Lileks’ book The Gallery of Regrettable Food ? This book is right up that guy’s alley. Hamburger Bean Medley. This includes baked beans, kidney beans, lima beans, and chow mein noodles, and makes my eyeballs ache. And just think of what it might do to your digestion. …and a spinach ring filled with creamed chicken, fish or eggs. 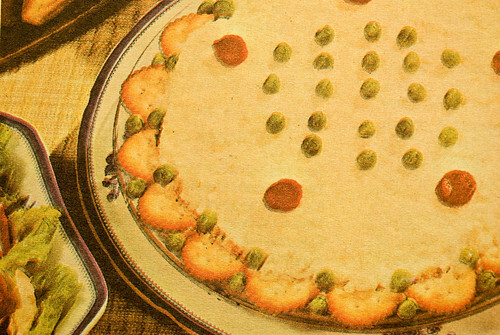 I was struck by the Chiffon Chicken Pie, which is sort of a whipped chicken jello in a cracker crust, lightly garnished with peas and chilled. 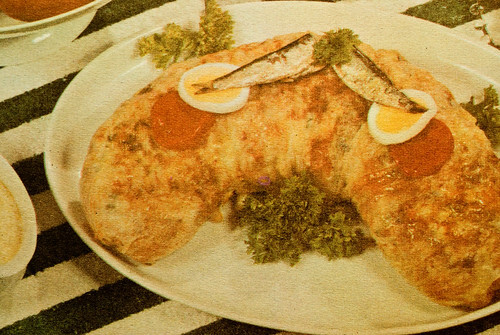 Also the Norway sardine egg strudel, which doesn’t sound bad but is one of the ugliest dishes I’ve ever seen. I don’t know why you’re supposed to bend it into a hot-dog shape that way. 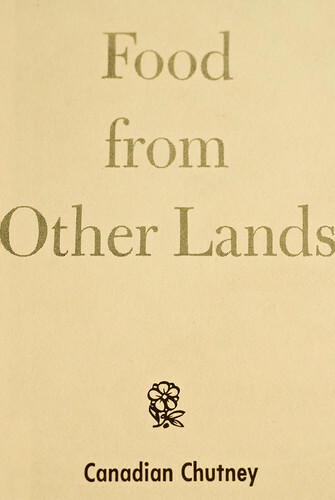 A “food from other lands” chapter resides in the back, beginning with “Canadian Chutney” and moving on to some highly dubious Chinese recipes that consist of cream of celery soup and overcooked bean sprouts. 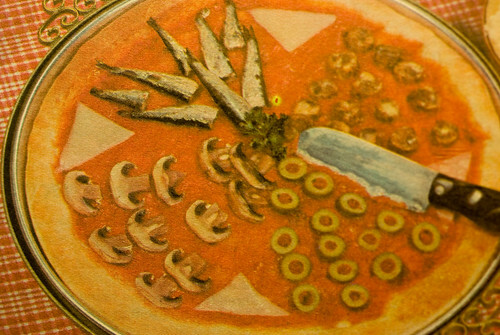 An interesting interpretation of pizza (also in the “foreign food” section). 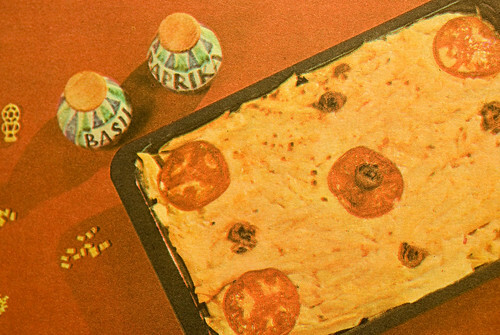 And some unusual recipes for mac and cheese casseroles. This one has little curls of anchovy carefully laid on top, and the cheese is a mixture of Cheddar and Swiss which sounds a bit odd to me. Other versions include chopped cucumber or whole sardines. This one is just peaches doused in Sauternes, but the picture gives me hysterics. The recipe specifies “triangular wafers” for just this effect. Mock chicken legs, made by shaping ground veal and pork into chicken leg shapes, breading them in cornflakes and frying them, then simmering them in water (I cannot imagine what this would be like). Ham Pineapple Yams, which seem to consist of a ham patty topped with a pineapple ring, then topped with a sweet potato patty and baked. Floating Chicken, which seems to be a Toad in the Hole with fried chicken instead of sausages. And a listing of The Uncommon Vegetables, which includes Chinese cabbage, horseradish, butternut squash, finocchi, celeriac, Jerusalem artichoke, and zucchini. This makes me very happy that we’re not living in the sixties any more. So if you’ve made it through all of that, I have a question for you. If I were to make one recipe out of this book, what should it be? Vote and let me know (feel free to write in your favorite if I haven’t picked it for the multiple choice), and I promise I will make the winning recipe and blog about it. I may even eat it, but let’s not get carried away. The polls will be open for one week! No, there are pimientos and green pepper strips. I don’t think there’s anything with a hint of capsicum in the entire book. Also, Ac’cent is a brand name for MSG in a can. Not sure about Zest. I know, did they actually find photos like that appetizing? It really was a different era. Ah, MSG explains a lot. Thanks! My friend Chris got a set of illustrated cookbooks from the late fifties and we screamed with laughter (and a bit of terror) over many of the recipes and photographs. 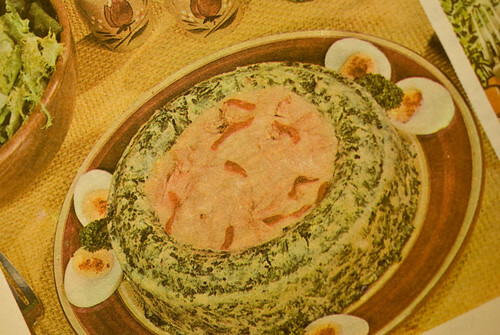 What was the deal with towers of molded food, weird, random garnishes and vegetables in Jello as side dishes? I went to many a Lutheran Ladies Luncheon as a kid only to be traumatized by frightening open-faced sandwiches and fruity Jello with a dollop of mayo or Miracle-whip for a special dessert! 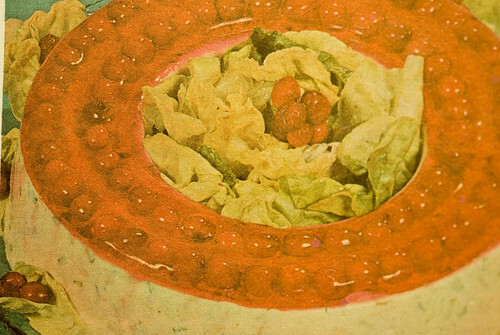 My mom was Queen of the Tomato Aspect…Lemon Jello with chopped peppers, green onions and tomato juice instead of the cold water. How I ever became a foodie is nothing short of miraculous. Eeewwww! I survived a lot of Grange potlucks as a kid, but that mostly meant a lot of tater-tot casserole and endless pans of mac and cheese. And the occasional lime jello with hot dogs in it. Okay, I had to vote for the Mock Chicken Legs, because they sound *just* *so* *weird*. Breaded, fried, and then… boiled??? The mind completely boggles. The strudel looks like something out of a science-fiction movie. Mark, it’s mostly the addition of canned baked beans that worries me about the Medley. And the chow mein noodles. I have no particular objection to meat and beans with mushroom soup, but these flavors sound a little odd. I’m afraid the “chicken” legs may win, however. I can’t wrap my head around why a recipe was developed for mock fried chicken. Is there a region where veal is more accessible/cheaper than chicken?? 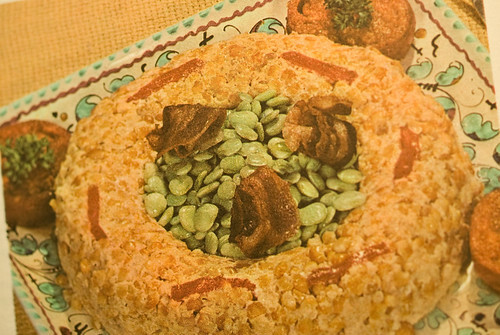 I was going to do a write-in vote for one of the rings, but I decided that was too cruel and stuck with the chicken pie. My main reaction to reading old timey American cookbooks is WHY WOULD YOU DO THIS TO YOURSELF AND YOUR FAMILY? I got some 1930’s cooking magazine a while back, and there was a “Galatine of Ham,” which was gelatin, ham, hard-boiled eggs…and pineapple. Pic below. Oh dear, jellied ham and pineapple. Not a pretty sight. I’m deeply puzzled by the mock chicken legs as well – you can have veal, but not chicken? Why shape it like chicken legs in the first place? Why add water? Why Why Why? Thank you for not voting for a ring. I was afraid I’d have to actually go out and buy a jello mold, god help me. I wish there had been a photo of the mock chicken legs, as I failed to read to the end before voting. 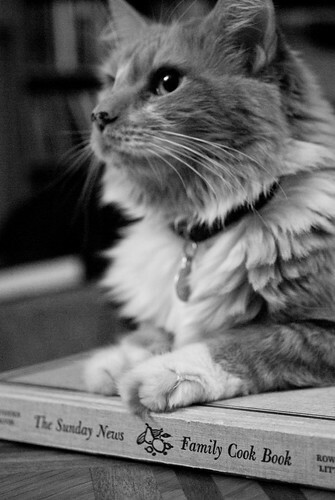 It’s kind of fascinating. As it was, I voted for whipped, cold, meat-jello pie in a Ritz cracker crust. My mother had a bottle of Accent on the shelf when I was growing up before we found out that MSG gives my grandmother migraines. I too collect old cookbooks with these bizarre recipes that I am desperately afraid of. My personal favorite on title alone is a somewhat unsavory-sounding recipe for “Group Stroganoff”. Can’t wait to hear how the winning dish turns out. The book doesn’t provide a photo of the chicken legs, sadly. I think I forgot to mention that they have crushed pineapple in them as well. Group Stroganoff does NOT sound like a good idea. It’s probably just the perpetual adolescent in me, but if I were invited over for some Group Stroganoff I’d make my excuses. pineapple in the chicken legs? i feel i’m being unintentionally, exceptionally cruel, but i must vote for that one.